This post is brought to you by our friends at Vivobarefoot. 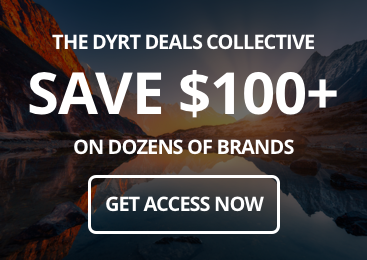 They make minimalist shoes that are flexible and rugged enough to adapt to almost any environment, from your daily routine at home to exciting adventures like treehouse camping. Treehouses have a way of capturing the imagination. 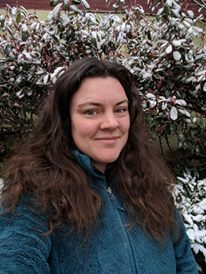 For centuries we’ve admired all sorts of treetop existences, from the Swiss Family Robinson’s shipwrecked setup to activist Julia Butterfly Hill’s very real 738-day anti-logging stint in a California redwood. There’s just something about life among branches that ignites a childlike wonder for the world. But you don’t have to imagine life in the trees. With treehouse camping, you can get up there and embrace the unique experience for yourself. You’d never guess you were so close to downtown Chattanooga when you’re treehouse camping in one of these beauts. They’re at the very foot of Lookout Mountain, where one of the biggest neighborhoods is called Fairyland. 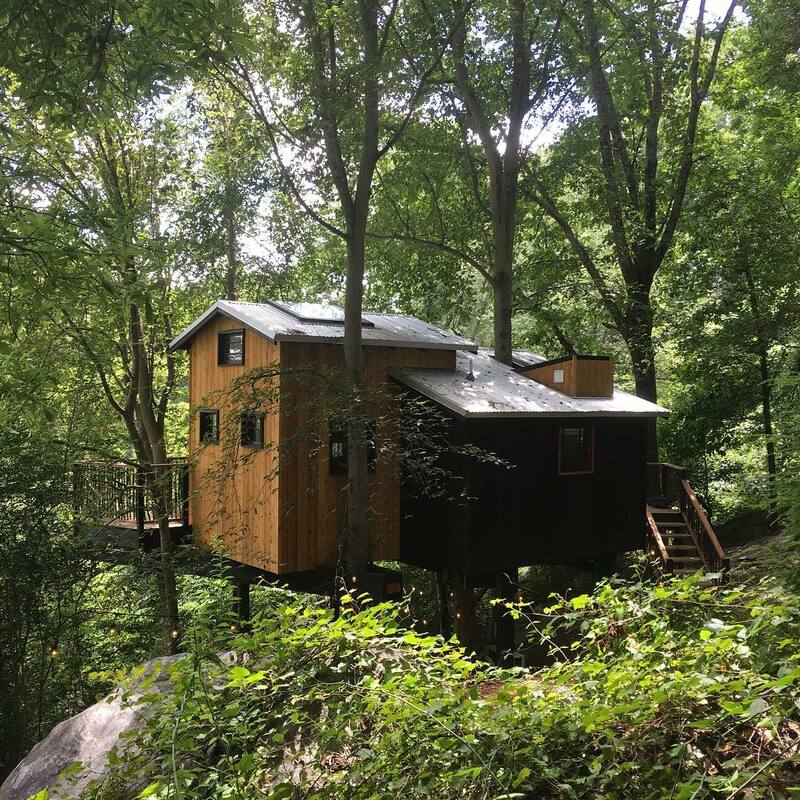 Treetop Hideaways are extra magical not only for the luxurious finishes but how close these treehouses are to some of the best outdoor attractions near the Scenic City. You’re just a short drive from Cloudland Canyon State Park, not to mention everything there is to do on Lookout Mountain from hiking and climbing at Sunset Rock to exploring the Point Park Civil War monument. Scramble through unique rock formations and see classic fairy tales recreated in trippy black-light glory at the Rock City, or go on a cave tour through Ruby Falls. 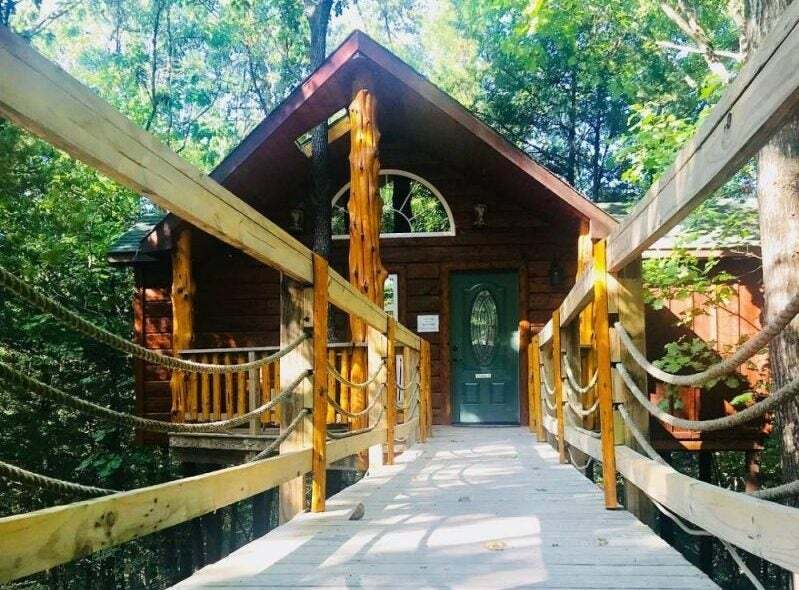 On the other hand, maybe you’ll choose to simply relax and enjoy the peace and quiet at Treetop Hideaways. Swing by Main Street Meats, Blue Fox Cheese Shop, and Velo Coffee Shop for all the supplies you need for a picnic in the branches. “The Treetop Hideaways really are these romantic little visions tucked away in the branches. They are built with found and salvaged materials that give a Swiss Family Robinson vibe and kept the project eco-friendly.” –-The Dyrt camper Meghan O.
You’re forgiven if your mind immediately jumps to the alt rock band of almost the same name that released the single “Everything You Want” in 1999. But Vertical Horizons Treehouse is anything but a one-hit-wonder. The Moskios family opened their first treehouse, The Cottage, in 2004 and have since gone on to build three more. 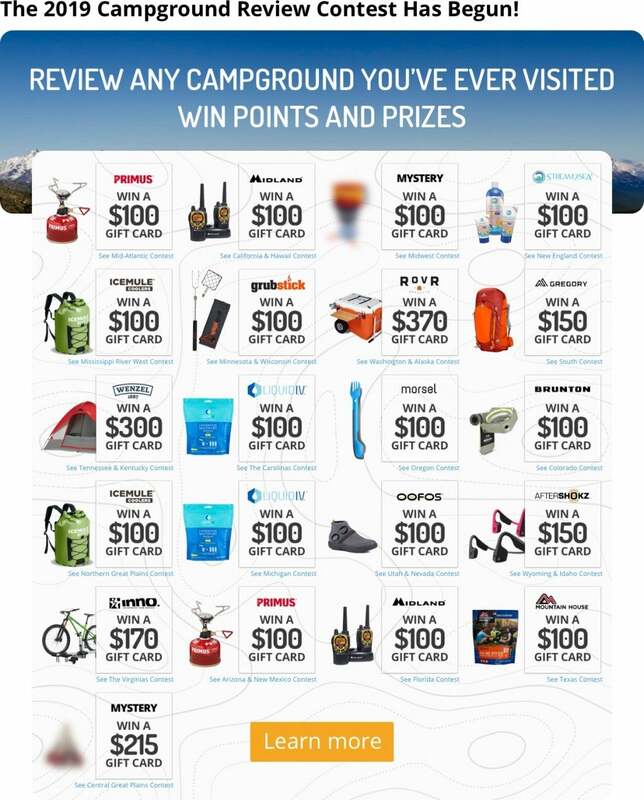 Here, visitors can choose between The Cottage, The shitake, The Calypso, and The Excalifir. 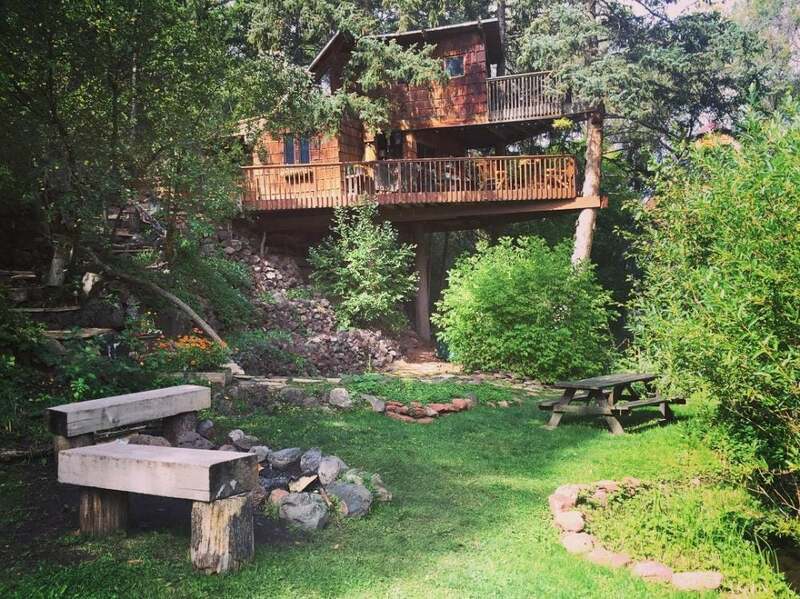 Each treehouse has a unique look and feel and is packed with bed and breakfast worthy comforts, including owner Phil Moskio’s famous morning meals. 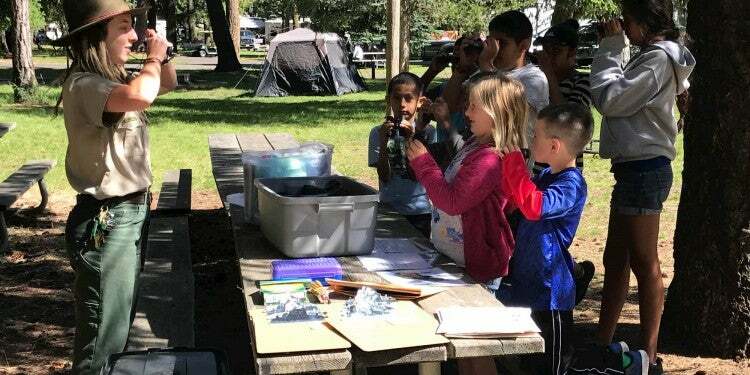 Whichever spot you choose for treehouse camping, you’ll have a great home base from which to explore everything Southern Oregon has to offer, including caves, wineries, and Vertical Horizon’s own disc golf course. Whether you’re treehouse camping during a balmy Maryland spring or a blustery winter night, the Treehouse Camp has a spot that will feel just right. They have ten three-season tree houses to enjoy in all but the coldest weather, and eight tree cottages that are fully insulated to withstand winter temperatures. They also have another unique sort of accommodation beyond the treehouses that is just as magical—a new Hobbit house with electricity, a wood stove for heating and cooking, harvest table, outdoor fire circle, picnic table, and charcoal grill. “The AT runs directly behind the campground, and is only a 6 mile walk into Harper’s Ferry southbound. The treehouses are very similar to the cabins, only these are screened in and open air, with no windows or stove. 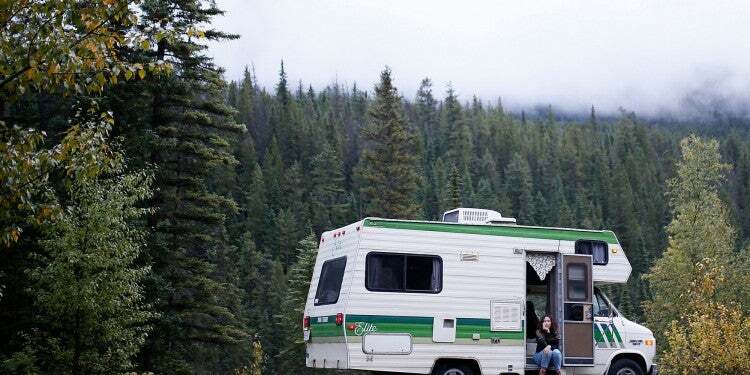 Still very comfortable.” –The Dyrt camper Bryan R.
In addition to tent sites, RV sites, and cabins, this Branson, Missouri treehouse camping destination also has beautiful hideaways in a variety of styles. Some are log cabin rustic, while others take their cues from nautical coastal architecture and another from African designs. Each has slightly different amenities, including some with gas fireplaces, jetted tubs, indoor and outdoor showers, and private decks. Nearby, explore Talking Rocks Cavern through one of their guided cave tours, Speleo Boxe mazes, or Dolly Parton’s famous Stampede show. There’s also a play called The Shepherd of the Hills that tells the story of the area’s history and what life is like here in the Ozarks. 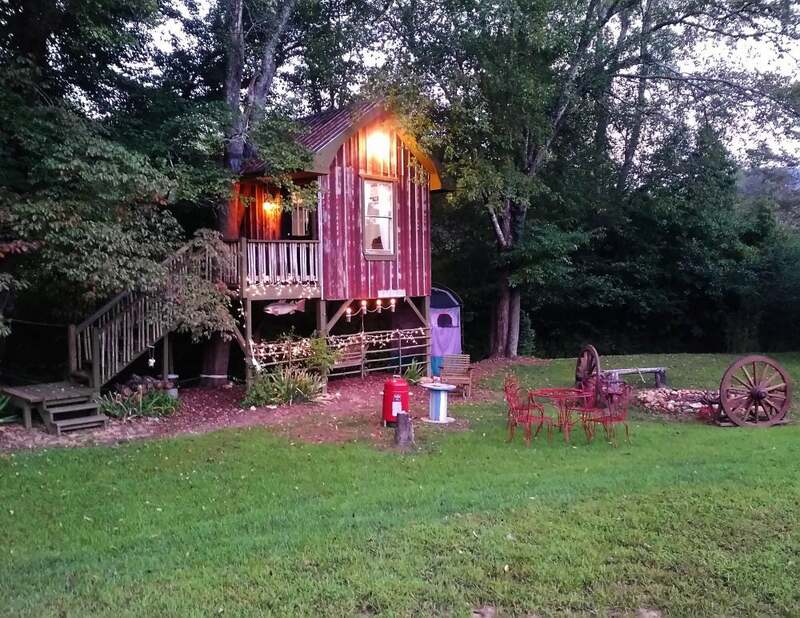 Photo from The Dyrt camper Mickey D.
Nestled in the Smoky Mountains, this treehouse is located on a pretty family farm. The property is often being updated and improved; the latest project is a new outhouse and an outdoor solar shower, currently in the works. Inside is climate-controlled comfort, nice mattresses, and lots of natural light. Beneath the treehouse is a dining area, and you can hang hammocks from the trees. 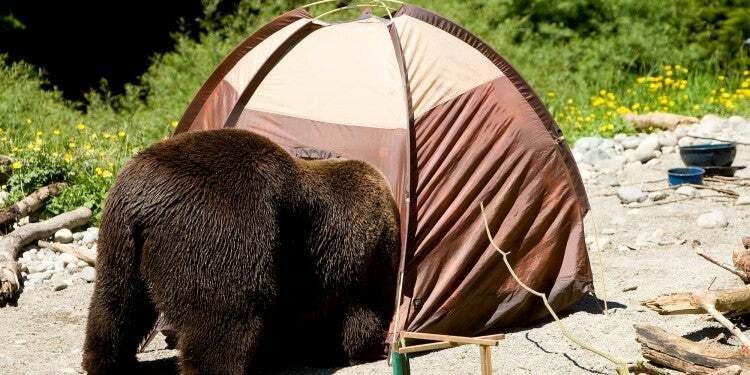 The great thing about treehouse camping in this part of the country is how close you are to some of the very best of the Appalachian Mountains. Not only is Great Smoky Mountains National Park right there, so is the beauty of the Unicoi River, Tellico Plains, Nantahala, and Brasstown Bald— the highest peak in Georgia. Drive an hour in any direction from North Sungate Farms and you’ll reach a spectacular place to explore. “Fun and relaxing creekside Glamping treehouse, there’s plenty of space for a few tents as well. The creek is cool and refreshing to enjoy rock hunting. Large fire pit and grill to make our dinner. We stargazed on one if the clear nights, looked like the planetarium!” –The Dyrt camper Mickey D.
Homegrown Hideaways doesn’t just have tree houses. They have aerial yurts that take treehouse camping to a whole new level. 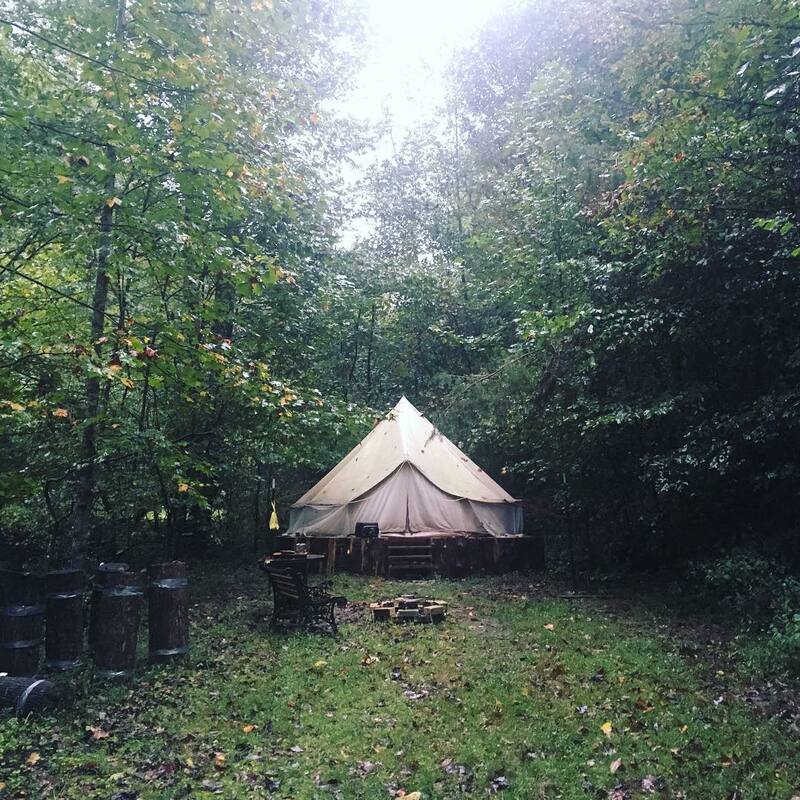 They also have glamping bell tents, RV sites, and a grand tipi as options for anyone looking for more of a luxe camping experience. Guests are welcome to enjoy a shared-use bathhouse when temperatures are above freezing, and the property also has four flush toilets and two solar-heated showers. While you’re in the area, go for a hike at the John B. Stephenson Memorial Forest and visit Anglin Falls, a pretty little sandstone cascade. Slip on your minimalist shoes and explore the urban Berea farm, or grab a pint at Boone Tavern after hiking along Boone Trace, the trail blazed by Daniel Boone in the spring of 1775. There are also many galleries, workshops, and craft events in Berea, including annual art fairs and crafty gatherings like the Battle of the Blacksmiths. 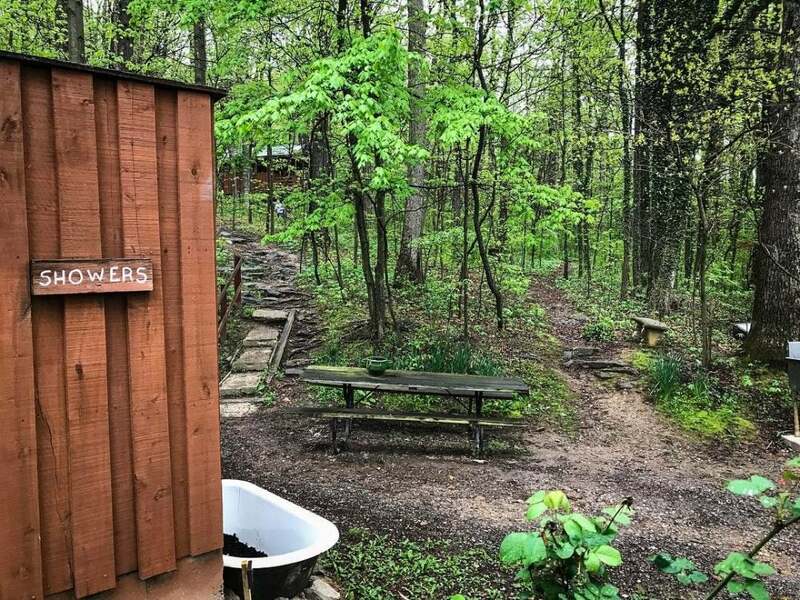 “Nestled in a narrow valley between high ridges of The Knobs, this campground gives you the feeling of secluded country living with your own trails and creeks to explore. The coffee is locally-roasted, fair trade, and most importantly, served fresh, early, and rich. All are welcomed here, including the primitive camper, the glamper, and the yurt goer along with the farm chickens and neighbor dogs.” –The Dyrt camper Carolyn S.
Lovers of yakpacking and treehouse camping will love the unique adventure you can have on the Edisto River, one of the longest free-flowing blackwater rivers in North America. A blackwater river is a temperate river that derives a dark color from the decaying plant matter and eroded soil you often find when rivers are overhung with forest or jungle growth. In this case, the Edisto picks up sediment as it winds through the Carolina Sandhills. 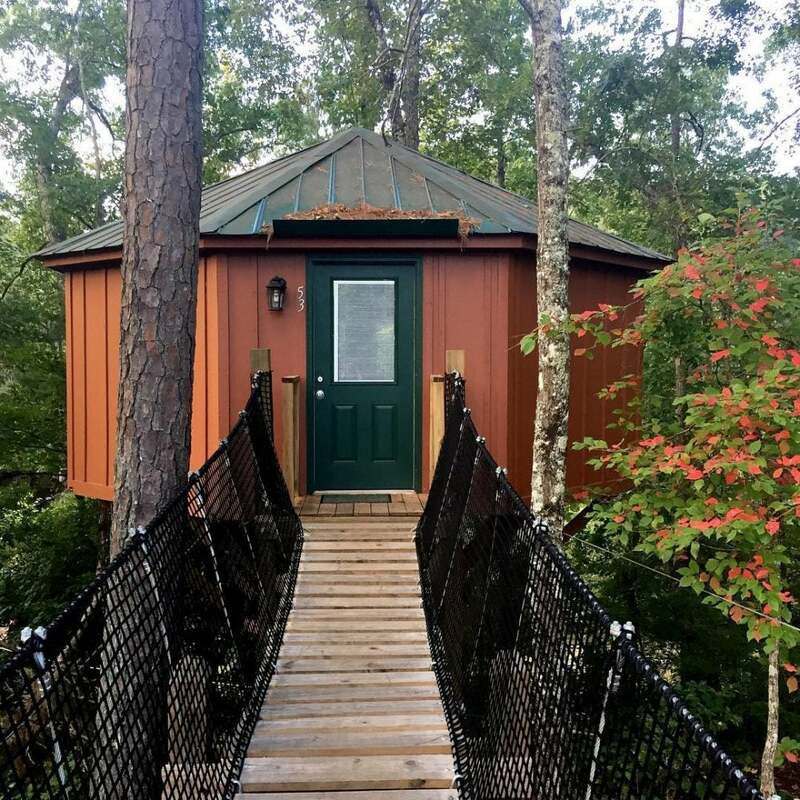 At Edisto River Treehouses, you can not only stay in the canopy overlooking a remote, rural river, you can also go on an adventure with Carolina Heritage Outfitters. 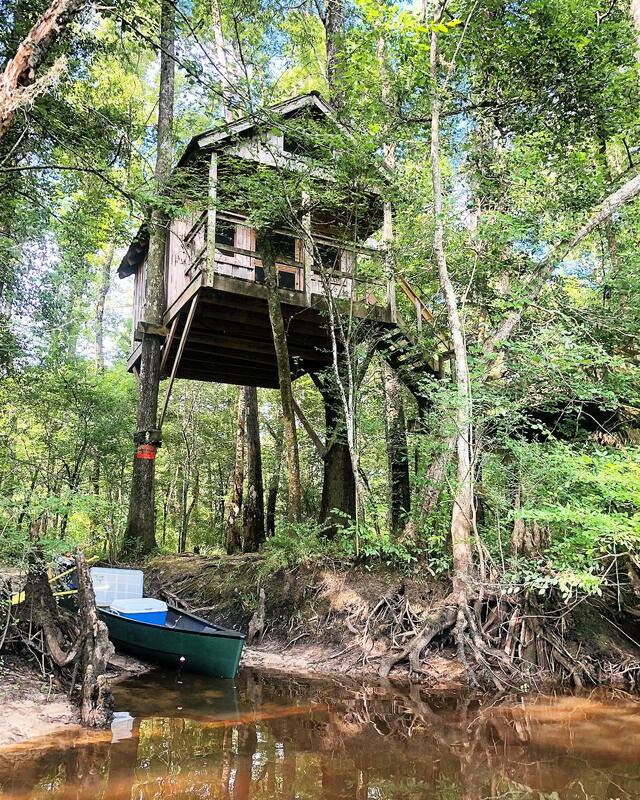 Edisto River Treehouses are at the halfway point of a 21-mile canoe trail. Paddle ten miles down the Edisto and stop to overnight in the treehouses, which are totally off the grid. Then paddle the next ten miles the following day, before you get a ride back to your car. Twenty-five feet up in a spruce grove, this treehouse has been in use since the 1970s. It has all the modern creature comforts, though, with a wood burning stove, full-sized kitchen, private mountain garden, firepit area, and an on-site hot tub. 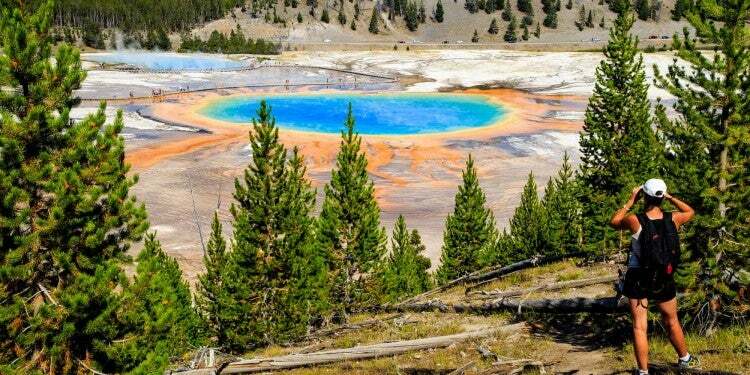 There are also natural hot springs to enjoy. Penny Hot Springs is about twenty minutes away in the White River National Forest. Head to Red Hill Recreation Area or trek up Mount Sopris to hike or mountain bike as the locals do. In the winter, nordic skiing is popular at the groomed Spring Gulch Trail System. Apres ski or hike, you can head to The Marble Distilling Co. for a local coffee liqueur that’s hard to beat. Pack a pair of minimalist shoes and you’ll have all the footwear you need for seamlessly traipsing from your private deck in the branches to a barstool at the local brewery. Cozy up in the hot tub at this Santa Cruz treehouse, where the trunks of two second-growth redwood trees grow up through the living and bathroom and stained glass abounds. The whole place has a funky, eclectic feel, as it was built by artists. There is a wood stove to keep you warm, a kitchenette to keep you well-fed, and lots of natural light to keep you in touch with the forest all around. 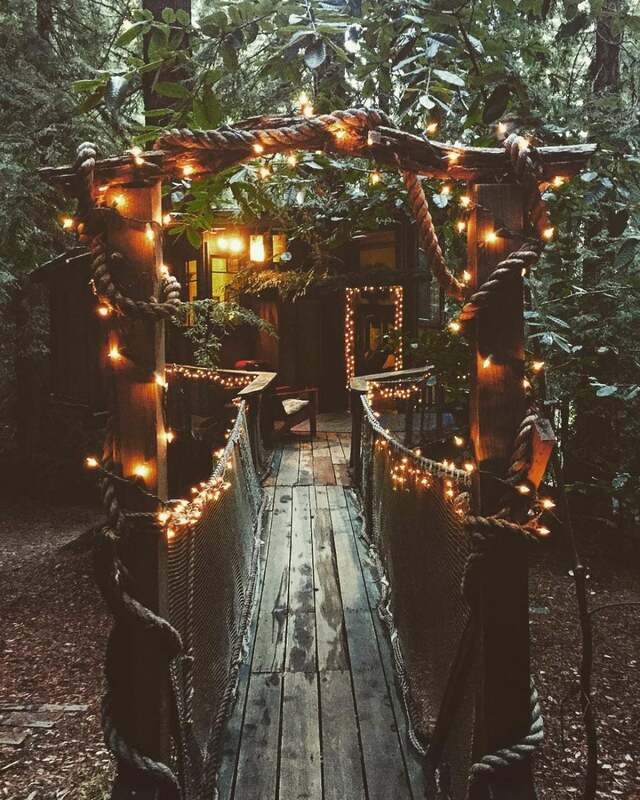 Redwood Treehouse camping is a great way to tackle the California Coast. This area is known for many tall, ancient Sequoias and Redwoods, as well as milder weather than elsewhere on the Pacific coast. It’s convenient to Monterey, Carmel-by-the-Sea, Big Sur, and Capitola. Go for a hike at Berry Creek Falls in Big Basin State Park, California’s oldest state park , or pay a visit to the Surfing Museum before you catch a few waves yourself. Afterward, stock up on treats from Santa Cruz Mountain Vineyard, which has been growing and making great wine since the 1970s. The variety of cabins and lodge rooms at Historic Banning Mills, Georgia would be more than enough to dazzle visitors. However, their octagonal tree houses take the whole experience to the next level. 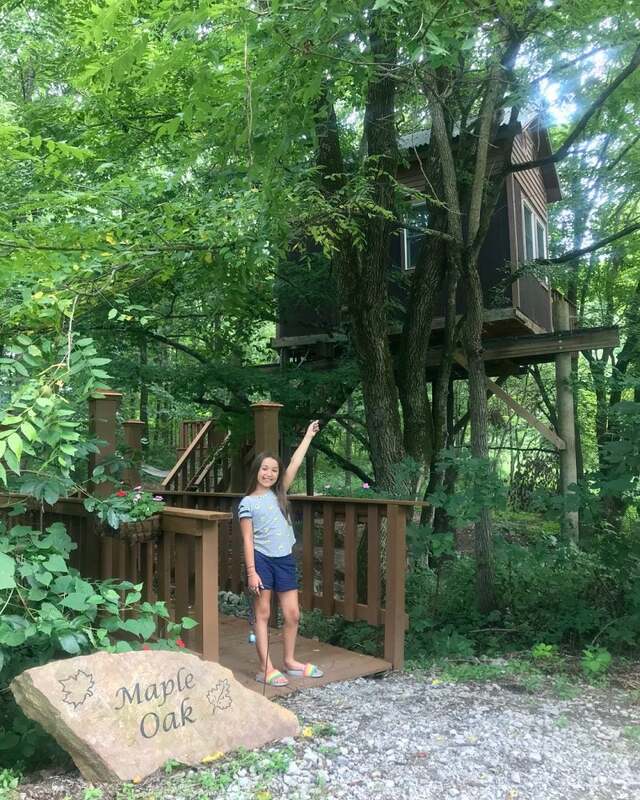 The treehouses can only be accessed by skybridge, an exciting way to come and go between your accommodations and all the other activities to enjoy on the property, including ziplining. 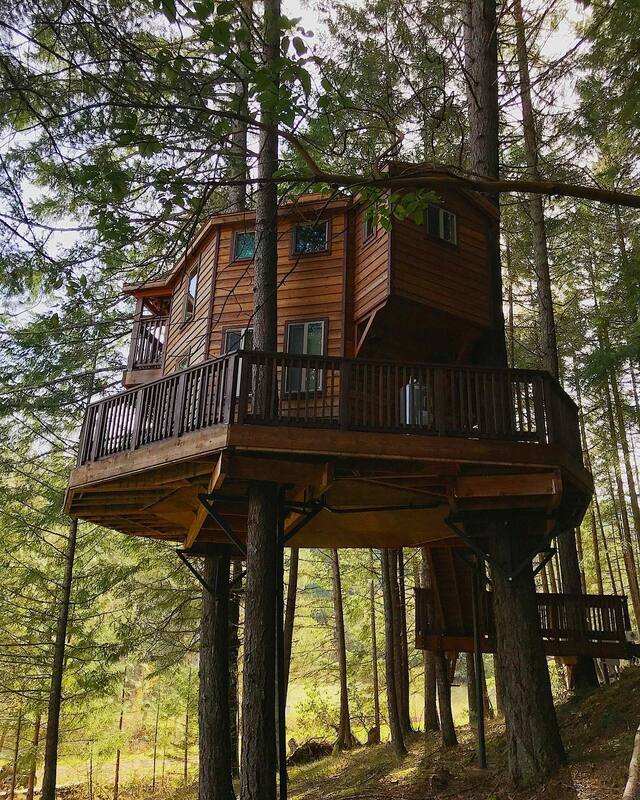 The tree houses themselves have king beds, gas fireplaces, hot tubs, and beautiful decks overlooking the surrounding Snake Creek Gorge. 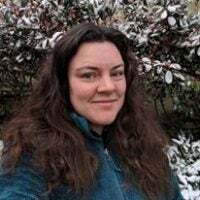 You can arrange packages that combine your stay at Banning Mills with horseback riding, kayaking expeditions, geocaching games, and even falcon hunting. There’s also a 14-story climbing wall on-site where you can practice your routes and rappelling techniques. On the edge of the Shawnee National Forest, two treehouses are set amongst 200-year-old white oaks and red maples. They have lots of niceties for treehouse camping such as air conditioning, a cooktop, toaster, convection/microwave, coffee pot and refrigerator, so if you enjoy cooking, you can definitely indulge here. Other activities at Timber Ridge include archery golf, mushroom foraging, kayak rentals, horseback riding, and more. Hike nearby to the ancient remains of an Indian village at Millstone Bluff, or to Ox-lot Cave, one of several caves in Shawnee National Forest that were once used as way stations on the underground railroad. Just outside of Cave Junction, Oregon, Augustino Estates is growing its powerhouse grapes on 350 acres in a lush river valley. They call the property their Rock’n R Ranch, and the crown jewel is a 1,500 square foot treehouse tasting room. 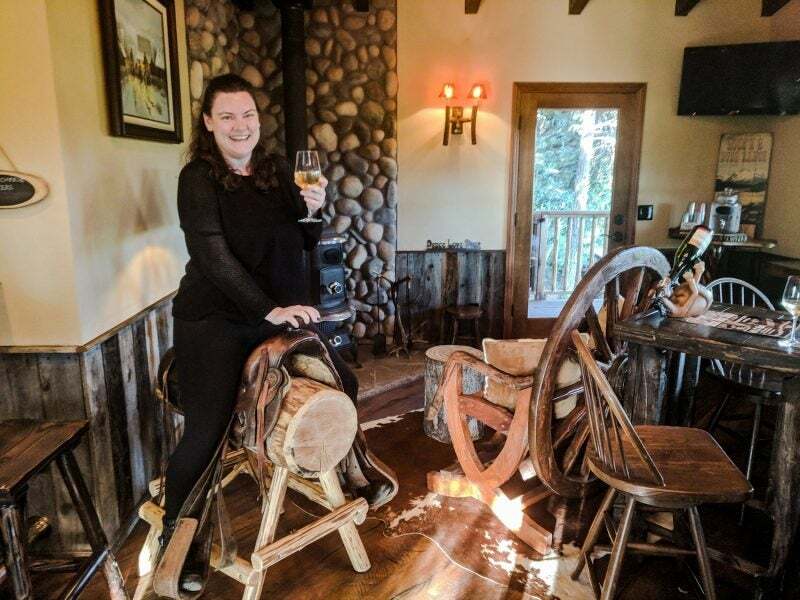 Here, you belly up to the wine bar on saddles, not bar stools, sip Southern Oregon vintages while admiring the alpenglow off the Siskiyou Mountains just across the California border. You can even see the salmon spawning as they make their way back up the South Fork of the Illinois River. That’s a pretty incredible experience in and of itself. Owners Reggie Boltz and Debbie Spencer take a lot of pride in welcoming new friends to their estate, and sometimes have regional chefs out to cook big, beautiful dinners for guests to enjoy under the stars. If you never want to leave, you don’t have to. You can call ahead to find out if the cabin and tipis on site will be available. If so, you can enjoy treehouse camping in two phases— first enjoying Augustino’s vintages in the treehouse, and then camping out in their comfortable, unique accommodations.